The development of FOX has been documented in the scientific literature. However, most of the published clinical results refer to the first generation which was entirely rule-based and deterministic. The Eargroup, the CI clinic led by Prof. Govaerts, has carefully analyzed their internal results with the current AI-FOX generation. On average tone audiometric thresholds lie between 20 dB HL and 25 dB HL at octave frequencies from 250 to 6000 Hz with little variation. In figure 1, a box and whisker plot is shown with tonal thresholds from post lingual CI recipients with a Cochlear device. At all frequencies, the P95 lies below 40 dB HL (PJ Govaerts, unpublished data). 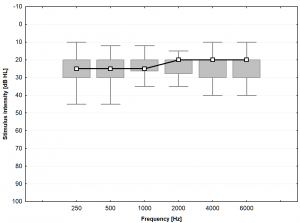 Figure 1: Box and whisker plot of audiometric thresholds in post lingual Nucleus CI recipients assessed between May 2017 and May 2018 (N = 50) (PJ Govaerts, unpublished data). The Box and whiskers represent the median (square), interquartile range (box) and non-outlier range (whiskers). Figure 2: Average phoneme scores on open set monosyllable word lists at different presentation levels (40, 55, 70, 85 dB SPL) in all post lingual adult patients fitted with FOX throughout the years (N=62), assessed in 2008 and 2016. Similar results were obtained in a cohort of patients who obtained their CI before 2007 and who were assessed in the same two years 2008 and 2016 (Eargroup, unpublished results). 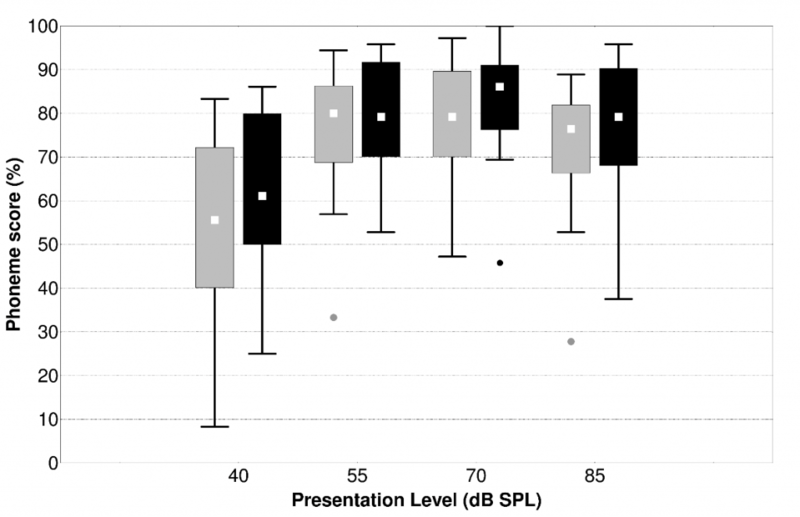 A similar result is illustrated in figure 3, taken from Meeuws et al., showing the improvement in speech in quiet scores, obtained in a cohort of experienced CI users coming back for an annual visit. In this session their maps were tuned with the current AI-FOX version, leading to an acute improvement in speech understanding by several percentages. 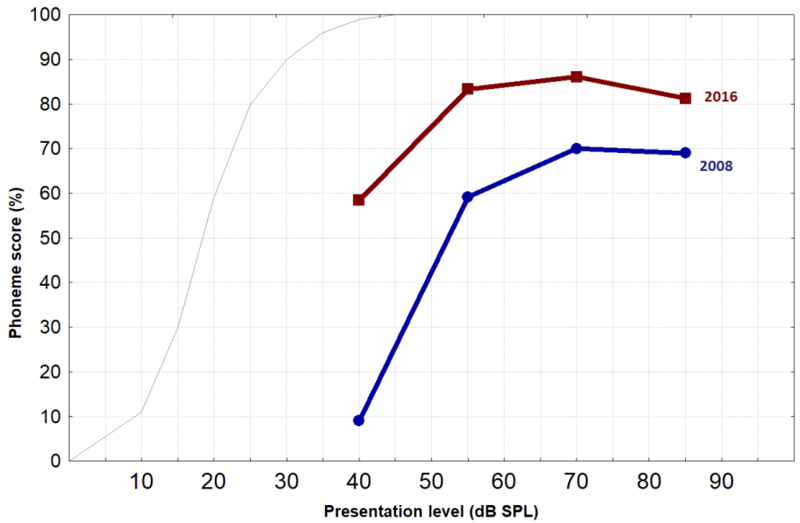 This shows that there is still improvement possible in speech performance for long-term CI users, with the help of AI-FOX and its learning capabilities. Figure 3: Box and whisker plots of the speech audiometry results before (light gray) and after (black) the FOX fitting of experienced CI users. 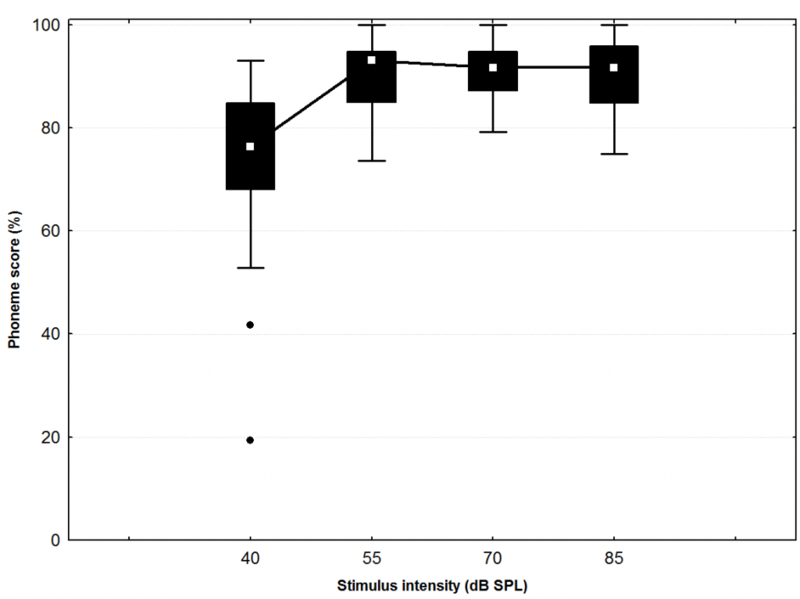 Finally, figure 4 shows the last speech audiometric results in quiet of Eargroup patients that were implanted before the age of one. All of the patients have been fitted with the help of AI-FOX throughout the years. The cohort has a median speech understanding of 89% (phoneme score). Figure 4: Box and whisker plot of the last speech audiometric results of Eargroup patients that were implanted before one year of age (n = 26).